Eurotech® Soccer Academies exclusive provider of North America's premier technical soccer training system, will hold its 2016 Louisiana soccer camps July 10-15 at Louisiana-Nicholls State University in Thibodaux. Enrollment is limited to 60 campers, so early registration is strongly recommended to ensure placement. Eurotech® Soccer World, developer and exclusive provider of North America's premier technical soccer training system, has announced its schedule of Louisiana soccer camps for the summer of 2016. 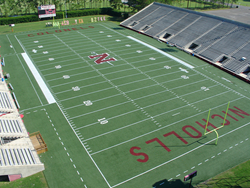 Camps will be held July 10th to 15th at Louisiana-Nicholls State University in Thibodaux, just west of New Orleans. 2016 marks the 16th year Eurotech® has operated summer soccer camps in Louisiana, and the 10th on the campus of NSU, whose women’s soccer coach, Dylan Harrison, is also Eurotech’s Regional Director. “We're thrilled to have Dylan back on the team again this year,” said Eurotech® National Director Jim Risher. “As both a Louisiana native and a talented Division 1 soccer coach, he brings ideal credentials to the job.” He’s also very familiar with NSU’s first class facilities, including a multi-million dollar Sports Recreation Center that ranks among the finest in the South. The campus is already home to a number of national sports camps, including the Peyton Manning Football Passing Academy. Eurotech’s soccer camps will take place from July 10th through July 15th. Campers can choose either a 4-day or 6-day session, with full day, extended day and overnight options available for both. Like all Eurotech® offerings, the NSU soccer camps are designed for competitive individual players, small groups, as well as club and high school teams, with separate programs for field players and goalkeepers. Enrollment is limited to 60 campers, so early registration is strongly recommended to ensure placement. Also, campers who act quickly can also take advantage of several discount opportunities, including an Early Registration discount of $25, a Returning Camper discount now $50 (new for 2016), and a Family Camper discount of $25. Email or call for soccer club discounts. For complete information about Eurotech’s Louisiana soccer camps, including pricing, visit EurotechSoccer.com. Unique mix of individual technical and tactical instruction, combined with tournament style matches to develop creative, versatile and confident soccer players. Certified coaching staff recruited from the finest youth programs in the world and featuring former professional, Olympic, collegiate, and national team players and coaches.